The present review collects the most relevant empirical evidence available in the literature until date regarding the effects of transcranial direct current stimulation (tDCS) on the human motor function. tDCS in a non-invasive neurostimulation technique that delivers a weak current through the brain scalp altering the cortical excitability on the target brain area. The electrical current modulates the resting membrane potential of a variety of neuronal population (as pyramidal and gabaergic neurons); raising or dropping the firing rate up or down, depending on the nature of the electrode and the applied intensity. These local changes additionally have shown long-lasting effects, evidenced by its promotion of the brain-derived neurotrophic factor. Due to its easy and safe application and its neuromodulatory effects, tDCS has attracted a big attention in the motor neurorehabilitation field among the last years. Therefore, the present manuscript updates the knowledge available about the main concept of tDCS, its practical use, safety considerations, and its underlying mechanisms of action. Moreover, we will focus on the empirical data obtained by studies regarding the application of tDCS on the motor function of healthy and clinical population, comprising motor deficiencies of a variety of pathologies as Parkinson’s disease, stroke, multiple sclerosis and cerebral palsy, among others. Finally, we will discuss the main current issues and future directions of tDCS as a motor neurorehabilitation tool. The central nervous system (CNS) works thanks to the communication between more than 100,000 millions of neurons, whose activity and networking is modulated by chemical and electrical processes . Across history, humans have been trying to alter the electrical brain processes to enhance human’s brain function, for the treatment of psychopathologies and for a better understanding of the brain physiology. For example, in the antiquity, modulation of the electrical processes of the brain started with the use of electrical impulses of torpedo fishes applied directly on the CNS, for therapeutic purposes . In 1746, Musschenbroek (1692–1761) used Leyde jars and electrostatic devices to treat neuralgia, contractures and paralysis. The discovery of biometallic electricity and the invention of the voltaic battery augmented the interest in the therapeutic effects of galvanism. Afterwards, Duchenne de Boulogne (1806–1875) upgraded the electrotherapy with volta and magnetofaradaic apparatuses. Fortunately, in the past Century, the technological advances and its integration in health sciences have let us go from uncontrolled and unsafe interventions with side effects to well-controlled, more effective and safe stimulation devices . Currently, the most used stimulation devices can be divided into invasive techniques, such as deep brain stimulation (DBS), and non-invasive brain stimulation (NiBS) techniques, whose most representative methods are transcranial magnetic stimulation (TMS) and transcranial direct current stimulation (tDCS) . Although results are variable , DBS has reported positive results over the motor function, especially on the motor symptoms of Parkinson’s disease. However, DBS is a technique that needs the implantation of the electrodes on the stimulated area, which is associated with the typical risk derived from surgery, as infections. Therefore, there is an increasing tendence on the search for non-invasive brain stimulation techniques, which can modulate the motor function avoiding those risks. Hence, NiBS are characterized for its easy and safe use and relatively cheap price, demonstrating also successful results in the treatment of neurological and psychiatric alterations . In the last decades, TMS has been the most researched and developed neuromodulation technique. TMS generates fast changes in the magnetic field delivering electrical currents through the brain, allowing the specific modulation of the cortical excitability through the initiation of action potentials . Multiple studies have already shown its efficacy and safe use for the treatment of multiple pathologies , serving also as a useful tool for the functional location of brain areas, especially regarding the motor cortex [8, 9]. However, TMS requires the participation of the participant, and due to its functioning, it is difficult to perform a sham condition, which is highly desirable especially in the research field. In addition, TMS produces in most of the cases undesirable side-effects, as headache . Therefore, the tDCS technique is attracting a strong interest in the neuroscience research field. tDCS has supposed a revolution in the last 15 years of research, solving most of the disadvantages of TMS . tDCS is a neuromodulation tool consisting on a battery connected to two electrodes, the anode and cathode, which are placed directly over the brain scalp and over extracephalic regions. The current flows between both electrodes and induces the depolarization or hyperpolarization of the membrane of the underlying neurons, which depends of the anodal or cathodal nature of the electrode , altering the neuronal excitability resulting in the modification of the brain activity . This device is completely portable, as it is provided by built-in rechargeable battery with duration of approximately 6 h stimulation time at 1 mA (0.5–1.5 W of power consumption), and needs approximately 7 h for complete recharging. In addition, including battery, it has a weight of 0.8 kg. Its portability is one of the biggest advantages of tDCS in the context of NiBS. Therefore, tDCS can be considered as a suitable complementary technique on motor rehabilitation therapy, allowing its application in different contexes, during the motor training and even combined with aerobic exercise [13, 14]. This non-invasive brain manipulation has opened the doors for a variety of potential treatments for the major neurological and psychiatry diseases , as depression , schizophrenia , Obsessive–Compulsive disorder  and addictions , among others. However, motor functions are the major target for clinical and non-clinical studies regarding tDCS, serving mainly as a potential tool in post-stroke rehabilitation , but also in pathologies like Parkinson’s disease . In addition, numerous studies have shown that tDCS produces changes in the brain plasticity processes, generating long-lasting effects that enhances even further its applicability in the neurorehabilitation field [22, 23]. Therapy that combines repetitive training with non-invasive brain stimulation is a potential avenue to enhance upper limb recovery after stroke. This study aimed to investigate the feasibility of transcranial Random Noise Stimulation (tRNS), timed to coincide with the generation of voluntary motor commands, during reaching training. A triple-blind pilot RCT was completed. Four stroke survivors with chronic (6-months to 5-years) and severe arm paresis, not taking any medications that had the potential to alter cortical excitability, and no contraindications to tRNS or MRI were recruited. Participants were randomly allocated to 12 sessions of reaching training over 4-weeks with active or sham tRNS delivered over the lesioned hemisphere motor representation. tRNS was triggered to coincide with a voluntary movement attempt, ceasing after 5-s. At this point, peripheral nerve stimulation enabled full range reaching. To determine feasibility, we considered adverse events, training outcomes, clinical outcomes, corticospinal tract (CST) structural integrity, and reflections on training through in-depth interviews from each individual case. Two participants received active and two sham tRNS. There were no adverse events. All training sessions were completed, repetitive practice performed and clinically relevant improvements across motor outcomes demonstrated. The amount of improvement varied across individuals and appeared to be independent of group allocation and CST integrity. Reaching training that includes tRNS timed to coincide with generation of voluntary motor commands is feasible. Clinical improvements were possible even in the most severely affected individuals as evidenced by CST integrity. It is estimated that 30% of stroke survivors have severe upper limb impairment , whereby the functional capacity of the paretic arm is diminished to the extent that it cannot be moved against gravity . For these individuals, who do not have sufficient movement with which to work, the provision of effective therapy can be challenging. The associated consequences are poor prospects for recovery , limited rehabilitation opportunities , and ultimately reduced quality of life (QoL) . Yet, if task-oriented practice can be made possible by some means, there exists the potential to promote motor recovery, and in turn make a significant positive impact upon individual QoL and alleviate burden of care. In seeking to achieve levels of task-oriented practice beyond those that are possible through traditional therapy alone, attention has therefore turned to enabling technologies, including “assistive” devices, and adjuvant methods such as peripheral nerve and brain stimulation. Best evidence syntheses [6, 7] suggest that goal-directed movements can be assisted by minimizing the mechanical degrees of freedom to be controlled, in combination with the augmentation of voluntary muscle activity via peripheral nerve stimulation of target muscles, or the use of mechanical actuators. To encourage positive changes in motor performance, the capacity to increase task difficulty through small, yet incremental progressions and provision of meaningful real-time visual and auditory feedback have also been highlighted [8, 9]. The authors have previously sought to implement these principles, using the Sensorimotor Active Rehabilitation Training of the Arm (SMART Arm) device to promote functional recovery in severely impaired stroke survivors [8, 9, 10]. It has been shown that 4-weeks (12-h) of community-based training of reaching in people greater than 6-months post stroke improved upper limb function (and increased reaching distance) , enhanced the specificity of muscle recruitment (elevated ratio of biceps to triceps activation during reaching) , and accentuated corticospinal reactivity (decreased motor evoked potential [MEP] onset latency) . Of particular interest in the context of the current study is the observation that not all individuals achieved functional gains. In these cases, the intrinsic neurobiological reserve of the injured brain may have been insufficient for repetitive training alone to drive recovery of motor function. A variety of non-invasive brain stimulation (NIBS) techniques are now being used with the aim of altering the excitability of brain networks that have the potential to be engaged during the execution of motor tasks. The most commonly applied NIBS techniques are transcranial-direct current stimulation (tDCS) and repetitive-transcranial magnetic stimulation (rTMS) . In general, the application of these techniques is predicated on the assumption that by altering the state of circuits within (contralateral) primary motor cortex (M1) in a manner that produces sustained increases in the excitability of corticospinal projections to the impaired limb (or by decreasing the excitability of circuits in the M1 ipsilateral to the impaired limb), therapeutic gains will be realised. The fact that these approaches have limited efficacy in severely impaired stroke survivors notwithstanding , there exist other forms of therapeutic NIBS that are motivated by a different premise. It is well established that in some circumstances, the addition of random interference or noise, enhances the detection of weak stimuli, or the information content of a signal (e.g., trains of action potentials) . In light of this phenomenon, it has been proposed that the application of transcranial random noise stimulation (tRNS) may boost the adaptive potential of cortical tissue . The present investigation is motivated by the conjecture that: if the delivery of random noise stimulation is timed to occur simultaneously with the generation of voluntary motor commands, it may serve to amplify functional adaptations invoked by the intrinsic neural activity. Implemented through a triple-blind pilot randomised control design, the specific aim of this study was to establish the feasibility of delivering tRNS, timed to coincide with the generation of the voluntary motor commands, in the context of reaching movements performed by individuals with chronic and severe upper limb paresis after stroke. Recognising that the response to any therapeutic intervention is constrained by the state of pathways that can convey signals from the brain to the periphery, diffusion-weighted magnetic resonance imaging (DW-MRI) was performed to characterize the structural integrity of the descending corticospinal tract (CST) projections for each participant. Ischemic damage to the brain triggers substantial reorganization of spared areas and pathways, which is associated with limited, spontaneous restoration of function. A better understanding of this plastic remodeling is crucial to develop more effective strategies for stroke rehabilitation. In this review article, we discuss advances in the comprehension of post-stroke network reorganization in patients and animal models. We first focus on rodent studies that have shed light on the mechanisms underlying neuronal remodeling in the perilesional area and contralesional hemisphere after motor cortex infarcts. Analysis of electrophysiological data has demonstrated brain-wide alterations in functional connectivity in both hemispheres, well beyond the infarcted area. We then illustrate the potential use of non-invasive brain stimulation (NIBS) techniques to boost recovery. We finally discuss rehabilitative protocols based on robotic devices as a tool to promote endogenous plasticity and functional restoration. Following an ischemic insult within the motor cortex, one or more body parts contralateral to the infarct result impaired or paretic. The degree of the motor impairment depends on many factors, such as the extent of the infarct, the identity of the damaged region(s) and the effectiveness of the early medical care. Substantial functional recovery can occur in the first weeks after stroke, mainly due to spontaneous mechanisms (Kwakkel et al., 2004; Cramer, 2008; Darling et al., 2011; Ward, 2011; Grefkes and Fink, 2014). About 26% of stroke survivors are able to carry on everyday activities (Activity of Daily Living or ADLs, i.e., eating, drinking, walking, dressing, bathing, cooking, writing) without any help, but another 26% is forced to shelter in a nursing home (Carmichael, 2005). Impairments of upper and lower limbs are particularly disabling as they impact on the degree of independence in ADLs. Overall, a significant percentage of the patients exhibit persistent disability following ischemic attacks. Therefore, it is critical to increase our knowledge of post-stroke neuroplasticity for implementing novel rehabilitative strategies. In this review we summarize data about plastic reorganizations after injury, both in the ipsilesional and contralesional hemisphere. We also describe non-invasive brain stimulation (NIBS) techniques and robotic devices for stimulating functional recovery in humans and rodent stroke models. The term brain plasticity defines all the modifications in the organization of neural components occurring in the central nervous system during the entire life span of an individual (Sale et al., 2009). Such changes are thought to be highly involved in mechanisms of aging, adaptation to environment and learning. Moreover, neuronal plastic phenomena are likely to be at the basis of adaptive modifications in response to anatomical or functional deficit or brain damage (Nudo, 2006). Ischemic damage causes a dramatic alteration of the entire complex neural network within the affected area. It has been amply demonstrated, by many studies, that the cerebral cortex exhibits spontaneous phenomena of brain plasticity in response to damage (Gerloff et al., 2006; Nudo, 2007). The destruction of neural networks indeed stimulates a reorganization of the connections and this rewiring is highly sensitive to the experience following the damage (Stroemer et al., 1993; Li and Carmichael, 2006). Such plastic phenomena involve particularly the perilesional tissue in the injured hemisphere, but also the contralateral hemisphere, subcortical and spinal regions. Figure 3. Example of a novel robotic system that integrates functional grasping, active reaching arm training and bimanual tasks. An example of a novel robotic system that integrates functional grasping, active reaching arm training and bimanual tasks, consisting of: (i) Virtual Reality: software applications composed of rehabilitative and evaluation tasks; (ii) TrackHold: robotic device to support the weight of the user’s limb during tasks execution; (iii) Robotic Hand Exos: active hand exoskeleton to assist grasping tasks; and (iv) Handgrip sensors to support the bilateral grasping training and evaluation (modified from Sgherri et al., 2017). [Abstract] Safety and Tolerability of Transcranial Direct Current Stimulation to Stroke Patients – A Phase I Current Escalation Study. tDCS currents >2 mA have not been investigated in stroke patients. This phase I dose escalation study establishes safety of up to 4 mA in stroke patients. No predefined major response was noted at any current level. Skin temperature did not rise, and skin barrier function remained intact. Transient skin redness without injury was a common finding irrespective of dose level. A prior meta-analysis revealed that higher doses of transcranial direct current stimulation (tDCS) have a better post-stroke upper-extremity motor recovery. While this finding suggests that currents greater than the typically used 2 mA may be more efficacious, the safety and tolerability of higher currents have not been assessed in stroke patients. We aim to assess the safety and tolerability of single session of up to 4 mA in stroke patients. We adapted a traditional 3+3 study design with a current escalation schedule of 1>>2>>2.5>>3>>3.5>>4 mA for this tDCS safety study. We administered one 30-minute session of bihemispheric montage tDCS and simultaneous customary occupational therapy to patients with first-ever ischemic stroke. We assessed safety with pre-defined stopping rules and investigated tolerability through a questionnaire. Additionally, we monitored body resistance and skin temperature in real-time at the electrode contact site. Eighteen patients completed the study. The current was escalated to 4 mA without meeting the pre-defined stopping rules or causing any major safety concern. 50% of patients experienced transient skin redness without injury. No rise in temperature (range 26°C-35°C) was noted and skin barrier function remained intact (i.e. body resistance >1 kΩ). Our phase I safety study supports that single session of tDCS with current up to 4 mA is safe and tolerable in stroke patients. A phase II study to further test the safety and preliminary efficacy with multi-session tDCS at 4 mA (as compared with lower current and sham stimulation) is a logical next step. We review investigations of whether tDCS can facilitate motor skill learning and adaptation. We identify several caveats in the existing literature and propose solutions for addressing these. Open Science efforts will improve standardization, reproducibility and quality of future research. The primary aim of this study was to evaluate and compare the effectiveness of two specific Non-Invasive Brain Stimulation (NIBS) paradigms, the repetitive Transcranial Magnetic Stimulation (rTMS), and transcranial Direct Current Stimulation (tDCS), in the upper limb rehabilitation of patients with stroke. Short and long term outcomes (after 3 and 6 months, respectively) were evaluated. We measured, at multiple time points, the manual dexterity using a validated clinical scale (ARAT), electroencephalography auditory event related potentials, and neuropsychological performances in patients with chronic stroke of middle severity. Thirty four patients were enrolled and randomized. The intervention group was treated with a NIBS protocol longer than usual, applying a second cycle of stimulation, after a washout period, using different techniques in the two cycles (rTMS/tDCS). We compared the results with a control group treated with sham stimulation. We split the data analysis into three studies. In this first study we examined if a cumulative effect was clinically visible. In the second study we compared the effects of the two techniques. In the third study we explored if patients with minor cognitive impairment have most benefit from the treatment and if cognitive and motor outcomes were correlated. We found that the impairment in some cognitive domains cannot be considered an exclusion criterion for rehabilitation with NIBS. ERP improved, related to cognitive and attentional processes after stimulation on the motor cortex, but transitorily. This effect could be linked to the restoration of hemispheric balance or by the effects of distant connections. In our study the effects of the two NIBS were comparable, with some advantages using tDCS vs. rTMS in stroke rehabilitation. Finally we found that more than one cycle (2–4 weeks), spaced out by washout periods, should be used, only in responder patients, to obtain clinical relevant results. Motor and cognitive impairment are frequent aftermaths of brain damage after a stroke. Many authors reports cognitive deficits in 12–56% of stroke patients and reduced performances in several cognitive domains in 32% (Ebrahim et al., 1985; Tatemichi et al., 1994; Patel et al., 2002). Moreover, dysfunctions in the use of upper limb and in functional walking are among the more common consequences for many stroke survivors. Of note, only 5% of adult stroke survivors regain full function of the upper limb and 20% do not recover any functional use. The severity of cognitive impairment negatively correlates with motor and functional recovery achieved in stroke patients after rehabilitation. Indeed, a cognitive assessment should be used to select patients that could have the best benefits from rehabilitation (Patel et al., 2002; Mehta et al., 2003; Saxena et al., 2007; Rabadi et al., 2008). Event Related Potentials (ERP) are a reproducible electrophysiological response to an external stimulus (visual or auditory), representing the brain activity associated with various cognitive processes such as selective attention, memory, or decision making. Interestingly, ERP can be valuable in the diagnosis of cognitive impairment and are able to track the cognitive changes during the follow-up in stroke patients (Trinka et al., 2000; Alonso-Prieto et al., 2002; Yamagata et al., 2004; Stahlhut et al., 2014). Recently, Non-Invasive Brain Stimulation (NIBS) techniques have been proposed as support of standard cognitive and motor rehabilitation. The application of NIBS in stroke rehabilitation arises from the observation that cortical excitability can be modulated after electrical or magnetic brain stimulation. It can be reduced or enhanced (Miniussi et al., 2008; Sandrini and Cohen, 2013) depending on many factors (stimulation parameters, type of stimulation technique, timing of the stimulation, brain target region, and state of mind). The physiological mechanisms underlying brain stimulation effects are still partially unknown, but several evidences explain these effects with Long Term Potentiation (LTP) and Long Term Depression (LTD) like mechanisms (Thickbroom, 2007; Fritsch et al., 2010; Bliss and Cooke, 2011). Repetitive Transcranial Magnetic Stimulation (rTMS) and transcranial Direct Current Stimulation (tDCS) are the most used NIBS techniques in rehabilitation (Hummel et al., 2005; Miniussi et al., 2008; Bolognini et al., 2009). Both can induce long lasting effect on cortical plasticity (30–90 min). Modification of cortical activity may improve the subject’s ability to relearn or acquire new strategies for carrying out motor or behavioral task, by facilitating perilesional activity or by suppressing maladaptive interfering activity from other brain areas (Miniussi et al., 2008). Even if most of the effects are transient, NIBS during or before a learning process may yield the behavioral improvements more robust and stable (Rossi and Rossini, 2004;Pascual-Leone, 2006). Indeed, during motor learning not only the fast (intra-sessions) and slow (inter-sessions) learning during training are relevant, but also the memory consolidation and the savings (Wessel et al., 2015). Plasticity induced by NIBS could thus have important effects not only in the online phase of motor rehabilitation, but also in the offline phases. A growing number of studies indicates that NIBS could be useful in chronic stroke rehabilitation (Hummel and Cohen, 2006;Sandrini and Cohen, 2013; Liew et al., 2014; Wessel et al., 2015), but no one compared directly the two techniques or explored the link between cognitive and motor improvement. TMS is able to directly induce action potentials in the axons while the currents used in tDCS (1–2 mA) cannot. The first technique is, therefore, best suited to be used offline, while the second can be used online in conjunction with other rehabilitation techniques or tasks (Wessel et al., 2015). Simis et al. (2013) compared rTMS and tDCS in healthy subjects, observing that both techniques induced similar motor gains. The comparison of brain plasticity induced by NIBS in pathologic subjects could thus extend significantly the Simis’ results. In this paper, the primary aim was to evaluate and compare the motor and cognitive changes induced by rTMS and tDCS in the upper limb rehabilitation in patients with stroke, both in short and in long term outcome. Secondarily we searched for a possible link between motor and cognitive measures. We chose the most effective paradigm of rTMS in chronic stroke according to meta-analyses and consensus papers (Lefaucheur et al., 2014), a low-frequency protocol applied onto the controlesional motor cortex (M1). For tDCS, in the absence of a gold standard, we chose a paradigm with a dual sites montage validated in non-inferiority trials (Schlaug et al., 2008; Lüdemann-Podubecká et al., 2014). The tDCS was performed in conjunction with a cognitive training focused on the brain representation of the hands, the mirror-box therapy (MT), to direct the neuromodulation effect as wished. Our aim was to create a paradigm easy to apply in a clinical setting. To compare the NIBS techniques in the same patients we created a treatment longer than usual applying a second cycle of stimulation, after a washout period, using different techniques in the two cycles (rTMS/tDCS). A longer NIBS stimulation could be beneficial in stroke rehabilitation? What are the differences between rTMS and tDCS in stroke rehabilitation? NIBS motor stimulation effects can modulate or be modulated by patients’ cognitive status? In the first study we evaluated if a cumulative effect, mediated by an offline improvement (consolidation or savings), was clinically detectable. We also evaluated the differences between a first priming cycle with rTMS followed by tDCS and first priming with tDCS followed by rTMS. In the second study we compared the effects of the two techniques to test if brain plasticity effects could depend on the type of NIBS. In the third study, we searched for a possible link between motor and cognition changes, evaluating if cognitive measures changed in patients with motor improvement differently from the patients without motor improvement. Figure 1. Experimental design. After screening the patients were randomized into three groups with different interventions: MT, Mirror Therapy; tDCS, transcranial Direct Current Stimulation; rTMS, repetitive Transranial Magnetic Stimulation. In the scheme the outcome measures: ARAT, Action Research Arm Test; P300, cognitive auditory evoked response potentials; NPS, neuropsychological test where assessed in multiple time frames; w, week; mos, months. Stroke is a leading cause of disability among adults. Existing rehabilitation programs haven’t been able to accomplish full motor recovery partially due to the pathologic plasticity exerted from the unaffected hemisphere to the affected one. This inhibition can be disrupted using non-invasive brain stimulation (NIBS). Transcranial magnetic stimulation (TMS) is a NIBS technique that has the capacity of depolarizing or hyperpolarizing neurons depending on the frequency of the pulses. Although several trials have been conducted to find the efficacy of low frequency rTMS for motor recovery after stroke, their results have been heterogeneous. One of the main variables that determine the response to rTMS is the dose, corresponding to the number of pulses delivered to the patients. However, due to the localization and the extension of the stroke, each patient responds differently to certain dose. Therefore, using the SPIRIT statement, we designed a protocol for an adaptive, phase II, randomized, sham-controlled clinical trial. The study proposed will include 75 patients between 45 and 80 years old, with hand function impairment after 1 to 3 years of stroke; it will exclude patients with severe cognitive or neuropsychiatric comorbilities, any previous stroke episode, Fugl Meyer (Upper limb) < 20, inability to understand the task or contraindications for rTMS. The study will have 3 arms: individually tailored (adaptive dosing) low frequency (1Hz) rTMS plus standard of care rehabilitation (physical therapy) compared to sham and fixed rTMS plus standard of care rehabilitation. The intervention will be applied during 6 weeks after which the main analysis will be performed. Subjects will be followed-up during 3 months and the results from this analysis will be exploratory. This protocol will use the results from the Pegboard test as a primary outcome and SF-36 questionnaire, hand strength, and responder´s rate as secondary outcomes. Previous studies suggested that both robot-assisted rehabilitation and non-invasive brain stimulation can produce a slight improvement in severe chronic stroke patients. It is still unknown whether their combination can produce synergistic and more consistent improvements. Safety and efficacy of this combination has been assessed within a proof-of-principle, double-blinded, semi-randomized, sham-controlled trial. Inhibitory continuous Theta Burst Stimulation (cTBS) was delivered on the affected hemisphere, in order to improve the response to the following robot-assisted therapy via a homeostatic increase of learning capacity. Twenty severe upper limb-impaired chronic stroke patients were randomized to robot-assisted therapy associated with real or sham cTBS, delivered for 10 working days. Eight real and nine sham patients completed the study. Change in Fugl-Meyer was chosen as primary outcome, while changes in several quantitative indicators of motor performance extracted by the robot as secondary outcomes. The treatment was well-tolerated by the patients and there were no adverse events. All patients achieved a small, but significant, Fugl-Meyer improvement (about 5%). The difference between the real and the sham cTBS groups was not significant. Among several secondary end points, only the Success Rate (percentage of targets reached by the patient) improved more in the real than in the sham cTBS group. 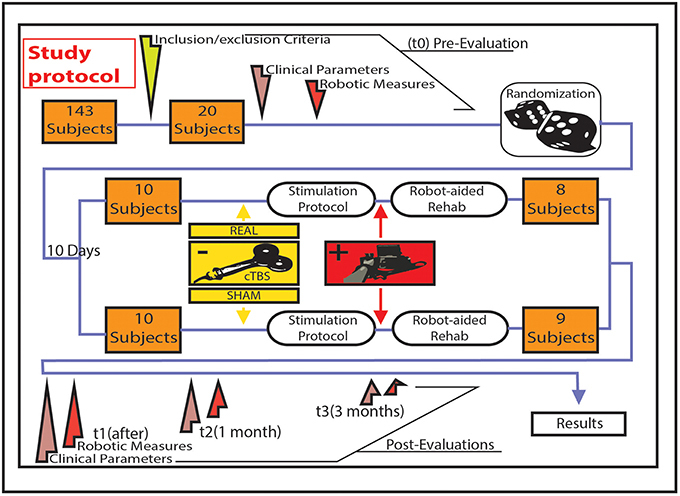 This study shows that a short intensive robot-assisted rehabilitation produces a slight improvement in severe upper-limb impaired, even years after the stroke. The association with homeostatic metaplasticity-promoting non-invasive brain stimulation does not augment the clinical gain in patients with severe stroke. Severe upper limb impairment in chronic stroke patients does not respond to standard rehabilitation strategies; for this reason there is the need of new treatments that might be effective in patients with drastically limited residual movement capacity. In patients with moderate to severe upper-limb impairment, a slight improvement have been reported using robot-assisted rehabilitative treatment, even years after a stroke (Lo et al., 2010). Another innovative approach for the enhancement of motor recovery is represented by non-invasive human brain stimulation techniques, such as repetitive transcranial magnetic stimulation (rTMS) and transcranial direct current stimulation (tDCS). These techniques can induce long-lasting changes in the excitability of central motor circuits via long-term potentiation/depression (LTP/LTD)-like phenomena (Di Pino et al., 2014b). A recent study reported a mild motor improvement after 10 sessions of rTMS in a group of severe chronic stroke patients (Demirtas-Tatlidedea et al., 2015). Aim of present study was to explore whether the combination of these two approaches might enhance their positive effects on motor recovery. To the end of assessing safety and potential efficacy of the combination of robot-assisted rehabilitation and non-invasive brain stimulation in a group of chronic stroke patients with severe upper limb impairment, we designed a proof-of-principle double blinded semi-randomized sham-controlled trial. We used continuous theta burst stimulation (cTBS), a robust form of inhibitory rTMS inducing LTD-like changes lasting for about 1 h . The choice of employing cTBS on the affected hemisphere was based on the findings of our recent study, which suggested that this inhibitory protocol can improve the response to physical therapy (Di Lazzaro et al., 2013). Moreover, rTMS protocols suppressing cortical excitability have been shown to strongly facilitate motor learning in normal subjects (Jung and Ziemann, 2009). Jung and Ziemann suggested that such enhancement might involve the phenomenon of “homeostatic” plasticity, which can be induced in the human brain using a variety of brain stimulation protocols (Karabanov et al., 2015). Considering the close link between LTP and mammalian learning and memory (Malenka and Bear, 2004), an enhancement of learning after LTD induction might appear a paradox. However, the experimental studies by Rioult-Pedotti et al. demonstrated the existence of a homeostatic balance between learning and the induction of LTP/LTD (Rioult-Pedotti et al., 2000), thus showing that the ease of producing synaptic LTP/LTD depends on the prior history of neural activity. In the context of stroke, this predicts that by delivering a rTMS protocol that induces LTD-like effects on the stroke-affected hemisphere before performing rehabilitation, would luckily result in better relearning (Di Pino et al., 2014a). Figure 1. Figurative illustration representing the algorithm of the study design, the evaluations carried out, and the treatments delivered. Treatment (real/sham cTBS + physical therapy) was delivered for 10 consecutive working days. Baseline evaluation was performed in the first day of treatment. Stroke is a leading cause of serious long-term disability worldwide. Functional outcome depends on stroke location, severity and early intervention. Conventional rehabilitation strategies have limited effectiveness, and new treatments still fail to keep pace, in part due to a lack of understanding of the different stages in brain recovery and the vast heterogeneity in the post-stroke population. Innovative methodologies for restorative neurorehabilitation are required to reduce long-term disability and socioeconomic burden. Neuroplasticity is involved in post-stroke functional disturbances, and also during rehabilitation. Tackling post-stroke neuroplasticity by non-invasive brain stimulation is regarded as promising, but efficacy might be limited because of rather uniform application across patients despite individual heterogeneity of lesions, symptoms and other factors. Transcranial direct current stimulation (tDCS) induces and modulates neuroplasticity, and has been shown to be able to improve motor and cognitive functions. tDCS is suited to improve post-stroke rehabilitation outcomes, but effect sizes are often moderate and suffer from variability. Indeed, the location, extent and pattern of functional network connectivity disruption should be considered when determining the optimal location sites for tDCS therapies. Here, we present potential opportunities for neuroimaging-guided tDCS-based rehabilitation strategies after stroke that could be personalized. We introduce innovative multimodal intervention protocols based on multichannel tDCS montages, neuroimaging methods and real-time closed-loop systems to guide therapy. This might help to overcome current treatment limitations in post-stroke rehabilitation and increase our general understanding of adaptive neuroplasticity leading to neural reorganization after stroke. Figure 1. Stimweaver simulations for (A) guided multichannel tDCS montages vs. (B) classical tDCS montages. (A) Multichannel tDCS representations for distributed cortical targets for (A.1) poststroke lower limb motor rehabilitation (top and back views, see Multichannel tDCS for Poststroke Lower Limb Motor Rehabilitation) and (A.2) poststroke aphasia rehabilitation (left and right views, see Multichannel tDCS for Poststroke Aphasia Rehabilitation). Optimal solution using eight Neuroelectrics Pistim circular electrodes (1 cm radius and Ag/Cl). Total injected current 4 mA. Plots of the normal component of the E-field (V/m) (left), tDCS target region (center left), priority level (center right), and relative error (right) shown on the gray matter. In the left column, positive (red) colors reflect ingoing, excitatory normal electric fields (blue the opposite). In the second column, red areas denote targets to facilitate activation and blue to suppress activation. The third column colors reflect the importance (weight) of each area taking positive values up to 20. A dark blue cortical area reflects minimum/default priority and a red area maximum priority. In-between colors denote the corresponding intermediate priority. The last column provides a visual display of the match of electric fields solution to target [the relative error (10)]. Note that this model may not fit each poststroke patient with lower limb (A.1) or language (A.2) impairment because areas important for restitution are likely to be different according to lesion size and location (see Multichannel tDCS for Poststroke Lower Limb Motor Rehabilitation and Multichannel tDCS for Poststroke Aphasia Rehabilitation for details). (B) Plots of the normal component of the E-field (volts per meter) of classical tDCS montages for (B.1) anodic poststroke motor rehabilitation (top, back, and frontal views) and (B.2) cathodic poststroke aphasia rehabilitation (left, right, and frontal views). Solutions using two Neuroelectrics Pistim circular electrodes. Total injected current 2 mA. (B.1) Anodic stimulation over the M1 affected area: “active” electrode on C1 and cathode (return electrode) over the contralateral supraorbital area (38). (B.2) Cathodic stimulation over the right homolog of Broca’s area: “active” electrode on F6 and anode (return electrode) over the contralateral supraorbital area (47). Based on already published large evidence, non-invasive brain stimulation (NIBS) techniques like tdCS represent very important approach for the improvement of abnormal brain functions in various conditions (psychiatric and neurological). NIBS can induce temporary changes of neural oscillations and performance on various functional tasks. One of the key-points in understanding a mechanism of NIBS is the knowledge about the brains response to current stimulation and underlying brain network dynamics changes. Until recently, concurrent observation of the effect of NIBS on multiple brain networks interactions and most importantly, how current stimulation modifies these networks remained unknown because of difficulties in simultaneous recording and current stimulation. Recently, in Neuroelectrics wireless hybrid EEG/tCS 8-channel neurostimulator system has been developed that allows simultaneous EEG recording and current stimulation. Now, a relatively new imaging technique called magnetoencephalography (MEG) has emerged as a procedure that can bring new inside into brain dynamics. In this context, our group conducted a successfully proof of concept test to ensure the feasibility of concurrent MEG recording and current stimulation using Starstim and a set of non-ferrous electrodes (Figure 1). But first of all, what actually is MEG? Magnetoencephalography (MEG) is a noninvasive recording method of the magnetic flux from the head surface. Magnetic flux is associated with intracranial electrical currents produced by neural activity (the neural currents are caused by a flow of ions through postsynaptic dendritic membranes). From Maxwell equations, magnetic fields are found whenever there is a current flow, whether in a wire or a neuronal element. Hence, MEG detects these magnetic fields generated by spontaneous or evoked brain activity.